Zong 4G, has maintained its edge as the data carrier of choice in the country through its unbeatable postpaid packages. Offering the most competitive call and data rates in the country, the company is offering on average 50% more data than its closest competitor on the largest and most sophisticated 4G network in the country. While the company’s supremacy in data is already well established, the decision to offer some of the most competitive call rates on its postpaid packages also speaks volumes of the company’s focus on customer centricity. All postpaid packages have been designed based on extensive customer feedback taking into account the network quality, competiveness and 4G coverage, leading the company to set an industry standard for wireless connectivity. Keeping in line with the company’s commitment of creating a complete 4G ecosystem, Zong 4G’s promise of unleashing ‘A New Dream’ and digitally revolutionizing everyday life in Pakistan serves as the underlying impetus behind its position as the No.1 4G network in the country. 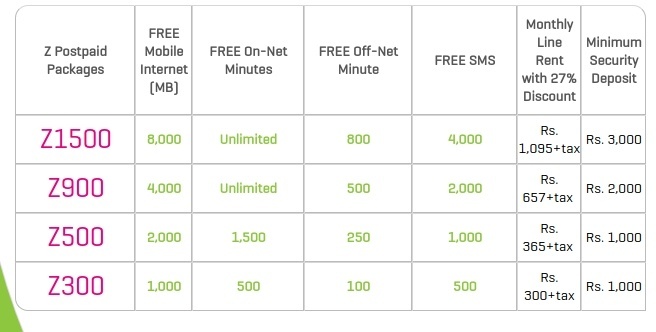 For more details on Zong 4G’s unbeatable postpaid packages, visit the company’s website. That is because even the Zong Website don’t have new packages yet, just blank. Zong has started its journey to become next PTCL. From last 2 weeks I have to restart my device twice a day to get back bytes to browse internet. How much are the taxes ? Including all types of taxes ! I have been using Z1500 for months now there is nothing new. Paid and totally biassed article . This discount offer expired on 31st may and no more valid. Amazed to see zong post supremecy according to writer. Propakistani losing quality . Currently Telenor is providing the cheapest data bundles in Pakistan though with no satisfactory speed in most of the coverage areas.